Forecasters are expecting a hot and dry summer over the coming months, meaning it’s time to start thinking about how we use our water in Selwyn. Meteorologists believe it is highly likely Canterbury will have a drier than average summer. Weather patterns over the last few months have been varied, with hot and windy days being interrupted by significant rain. The Council’s Asset Manager Murray Washington says at the moment water demand is manageable. “However, water supplies are placed under pressure during summer as many people decide to wat er their lawns and gardens at the same time.” Water demand peaks between 6–9am and 4–9pm." 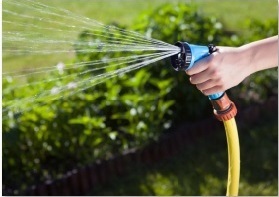 We are recommending that residents limit garden and lawn watering to after 9pm, to keep it away from peak usage times and ensure the sun doesn’t quickly evaporate the used water. If you are considering watering your lawn during the day, it is best to check the conditions and make sure that it won’t be too hot or windy when you do it, which would reduce the effectiveness of the water use. With volumetric charging for water use, consumers are reminded that wasting water can also hit them in the back pocket. Murray says that with everyone playing their part, we will be able to provide water at a good pressure all summer long.